My first involvement in a blog giveaway, I'm so excited. 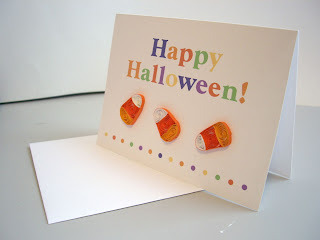 Crafty Ladies is hosting a contest over on their blog, http://creativeladies.blogspot.com/; to win one of my halloween cards - candy corn. You can enter October 1st - 6th by dropping by and posting a comment on the contest thread with your favorite item from my shop, http://quillynilly.etsy.com/. The contest is open to everyone. So get to it, enter now and good luck! I will also offer a 10% discount (custom orders included; on total purchase, before shipping) to anyone who leaves a comment during that time - let me know in notes to seller and I will send you a revised invoice.